Clean bovine protein isolate obtained using special technology for enzymatic hydrolysis. Improve your growth and regeneration today! The highest quality beef anabolic amino acids! The sample is an ideal choice as afraid to buy a full-size product! A POWERFUL DOSE OF AMINO ACIDS IN EACH SERVING! FA XTREME HYDROLYZED BEEF PROTEIN ISOLATE - THE MOST VALUABLE ANIMAL PROTEIN IN THE WORLD! Not without reason biggest names in the world of bodybuilding date back to just after the protein from beef! Do not wait and provide your body with excellent building material to improve the rate of growth of muscle tissue. FA Xtreme Hydrolyzed Beef Protein Isolate is pure beef protein isolate obtained using a unique process of enzymatically hydrolyzed bovine albumin. It provides the specific amino acids in a peptide. The enzymatic hydrolysis used in the production of this protein to a minimum reduces the time needed for the body to digest the protein and immediately delivers it directly into muscle cells. 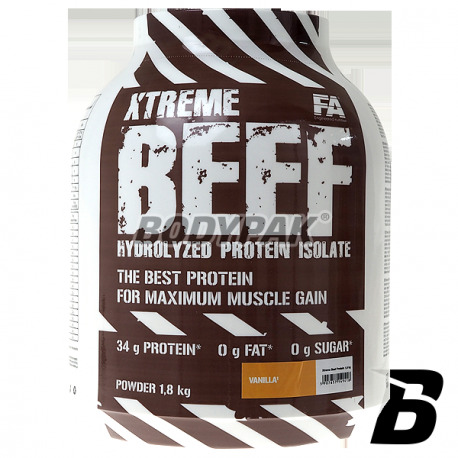 FA Xtreme Beef Hydrolyzed Protein Isolate offers you the best source of protein, which stimulates your muscle fibers and develops your motor characteristics such as strength, speed and endurance. It will help you to become stronger, faster, more agile and provide you with a lot of high quality muscle mass! 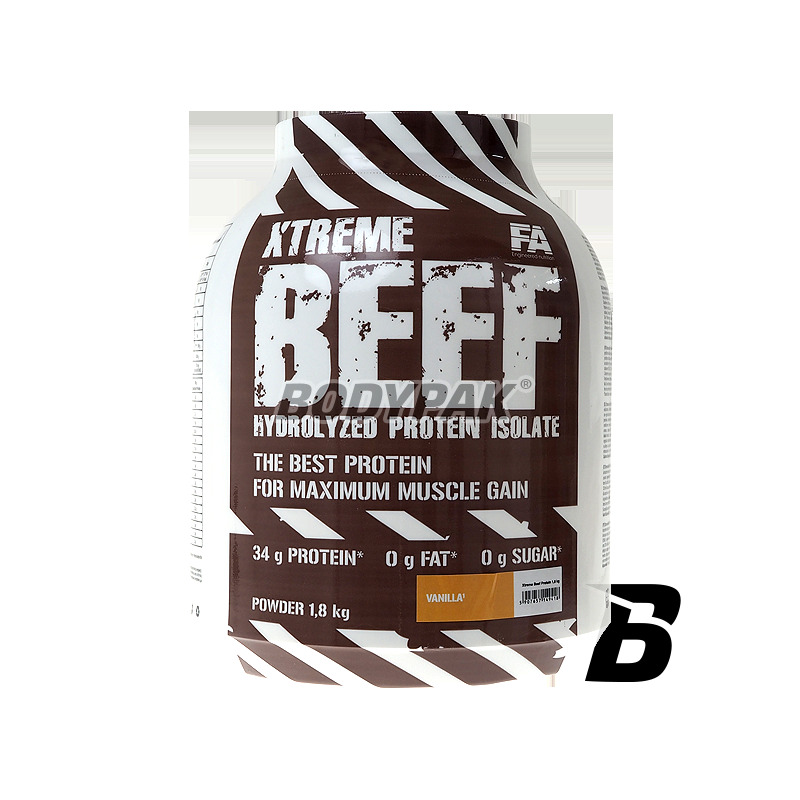 FA Xtreme Beef Hydrolyzed Protein Isolate gives your muscles the power that builds proteins from red meat, which has a higher concentration of amino acids than whey protein, eggs or milk. Hydrolysed whey protein beef is 350% more concentrated in terms of muscle building amino acids than the popular beef steak and also does not have a single gram of fat, sugar, lactose and cholesterol. From ancient times to the present day strongmen and athletes around the world they ate and still eat large amounts of red meat especially beef, to increase strength and power. Nutritional power of beef is not questioned and are still used in the diet of all athletes, especially those practicing strength and strength-endurance. Prominent lifters, bodybuilders, powerlifters confirm that the greatest progress in the increase of muscle mass and strength have made when joined to his eating beef as a protein source. Beef consumed in moderation should be an essential part of a healthy diet each athlete and contains no carbohydrates. Now, thanks to the advanced technology of obtaining protein from beef we have for you a hydrolyzed beef protein isolate in the form of nutritional and taste a cocktail of protein. 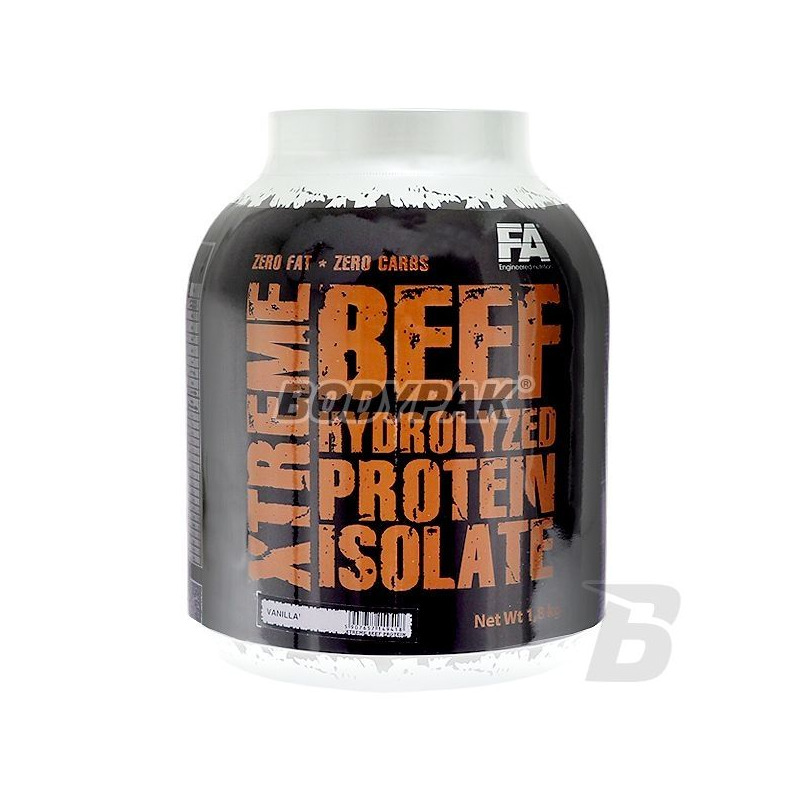 FA Xtreme Hydrolyzed Beef Protein Isolate is an innovative high-protein product, which was created through the use of hydrolysis and isolation. Thanks to the advanced technological processes established hydrolyzed beef protein isolate, which provides your muscles with building the capacity of proteins red meat with a very high content of all the essential amino acids and especially very high doses of Proline, Xydroksyproliny, Glutamine. Proline is a very specific amino acid, which the human body needs the most abundant to carry out proper muscle protein synthesis and collagen. Thanks to its strong regenerative ability may accelerate the rebuilding of collagen and wound healing after trauma or injury therefore recommended for athletes and people working hard physically. Strongly stimulates the regeneration after every intense effort and helps to significantly improve muscle mass and its reconstruction after strength training. Glutamine is another very characteristic amino acid responsible for muscle growth and the processes of immunity. It is ideal "carrier" nitrogen and thanks to the special molecular structure, can easily synthesize the amide nitrogen and transported it in the body where it is needed for protein synthesis immunity. L-glutamine, which is usually released from the muscle tissue and improves the function of the gastrointestinal tract, increases the production of glycogen in the liver and is required to degrade "poison cell" or ammonia into urea in the urea cycle. FA Xtreme Beef Hydrolyzed Protein Isolate addition ,, nourishes and protects your joints and tendons, "because it provides three unusual action of amino acids: Glycine, Hydroxyprolinę, Proline. They are ideal proportions relative to each other and up to a high concentration. This specific amino acids, of which directly formed collagen in the human body. Collagen is the major structural protein, forming molecular particles that build and strengthen joints tendons, ligaments and muscle tissue and connective tissue. Składniki: hydrolizowany izolat białka wołowego, kakao5, substancja zagęszczająca (guma ksantanowa), aromaty, barwnik (sproszkowany korzeń czerwonego buraka)3, barwnik (karmel)5, regulator kwasowości (kwas cytrynowy)3, substancja słodząca (sukraloza), barwnik (beta-karoten)1,4. Pierwsze wołowe białko jakie kupiłam i z pewnością zakupię ponownie- smak ok, słodki, ale to dla mnie plus; rozpuszczalność 4/5; konsystencja mega - coś jakby kisiel, polecam zmiksować z owocami! Fajna odmiana czy może raczej uzupełnienie dla wpc czy wpi, inny profil aminokwasowy, efekty też już jakieś...polecam! Nigdy nie piłem lepszego w smaku Hydrolizatu Wołowego. Po prostu rewelacyjny i bardzo dobrze rozpuszczalny!